The Iowa, Miami, Ottawa, and Sioux tribes lived along the Mississippi River. The Omaha, Otoe, and Missouri tribes lived in the western part of the state. There are many famous Native American tribes who played a part in the history of the state and whose tribal territories and homelands are located in the present day state of Iowa. Some tribes adopted the woodland culture and others the Great Plains culture. 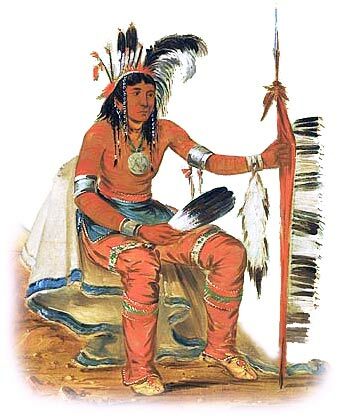 The woodland tribes were the Illinois, Iowa, Nez Perce, Pahodja, Pawnee, Winnebago, Missouri, Moingwena, Omaha, Oto, Ottawa, Peoria, Ponca, Potawatomi and the Winnebago (also known as the Ho-Chunk Nation). Other tribes included the Chippewa, Dakota Sioux, Fox and Sauk. By the 1850s, almost all of the original inhabitants of Iowa had been moved off their homelands to settlements further west. The climate, land, history, environment and natural resources that were available to the indigenous Indian tribes in Iowa resulted in the adoption of the Woodlands culture and some adopted the Great Plains Indians culture. 10,000 B.C. : Paleo-Indian Era (Stone Age culture) the earliest human inhabitants of America who lived in caves and were Nomadic hunters of large game including the Great Mammoth and giant bison. The history of the European invasion brought epidemic diseases such as tuberculosis, cholera, influenza, measles and smallpox. The Native Indians of Iowa had not developed immunities against these diseases resulting in huge losses in population. Exploitation including the leverage of taxes, enforced labor and enslavement were part of their history, taking their toll on the Iowa Indians.